The NVQ Sri Lanka provides the opportunity to achieve international recognition for qualifications, skills and knowledge. 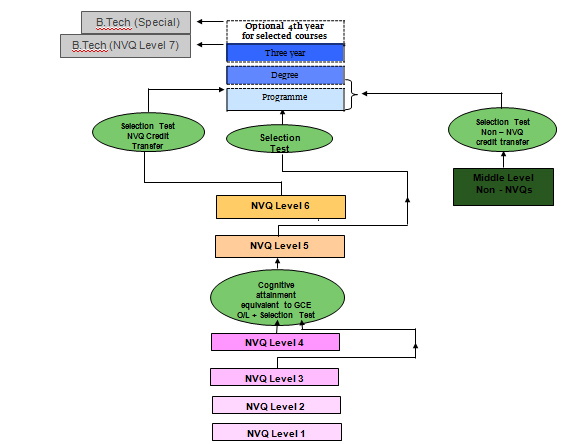 There are seven levels of qualifications from Level 1 to Level 7. National Certificate for Level 1 is recognizing the acquisition of a core of entry level skills. National Certificate for Level 2, 3 and 4 is recognizing the increasing levels of competencies. Level 4 qualification awards for full national craftsmanship. Level 5 and 6 is a National Diploma and it recognizes the increasing levels of competencies ranging from technical level to management level. Level 7 is a Bachelors Degree or equivalent. Certification of these levels are carried out by the institutions accredited by the TVEC and they are nationally recognized. There are 37 Technical Colleges scattered throughout Sri Lanka. These institutions are managed by Department of Technical Education & Training which functions under the Ministry of Skills Development, Vocational and Technical Education. They offer National Certificates and Advanced diplomas in engineering technician, engineering craft and business studies. Sri Lanka Institute of Advanced Technical Education (SLIATE) has Advanced Technical Institute (ATI) in every province for both Engineering and Business Studies. At present it manages and supervises 10 separate Advance Technical Institutes and 7 Sections housed in the Technical Colleges under Department of Technical Education and Training to conduct the courses of Higher National Diplomas and National Diplomas. IET (Formerly: Technician Training Institute) offer four year National Diploma in Engineering Sciences (NDES) course. This course contains theoretical instructions and industrial training. The academic component of the course is conducted at this institute and industrial training is imparted at recognized industrial establishment. The course provided nine (09) specialization’s under the three main disciplines of Engineering Civil, Electrical and Mechanical. im finish my a/l study so im canfiusing my next movemend. i chouse Graduate degree at jaffna.is this ok?